Buffalo is booming and there are plenty of great sights to see, from the natural beauty of Niagara Falls to the artistic talent on display at the Albright-Knox Gallery. However, there’s also plenty to do around Buffalo that’s not quite as high profile but still full of history and interest. One of the perks of enjoying a city like Buffalo is that there are plenty of hidden gems scattered throughout the city and the surrounding area. We’ve gathered a few favorites to share. Some might be familiar to long-time Buffalo residents but all have one thing in common: they reinforce just how much fun it is to be part of the Buffalo community. The Broadway-Fillmore district of Buffalo is replete with unique landmarks commemorating the city’s Polish heritage. One favorite gem is the Adam Mickiewicz Library and Dramatic Circle, a non-profit organization and private club that’s been dabbling in the arts for over 100 years. Plan your visit with a goal of finding plenty to read (the library is home to more than 4,000 books and hundreds of Polish theatrical scripts). Then, if you’re visiting on a Friday or Saturday night, extend your visit by enjoying plenty of variety when it comes to beverages. The library’s private club charges a small fee for entrance, but the access to a tremendous selection of Polish beers more than makes up for the cost. 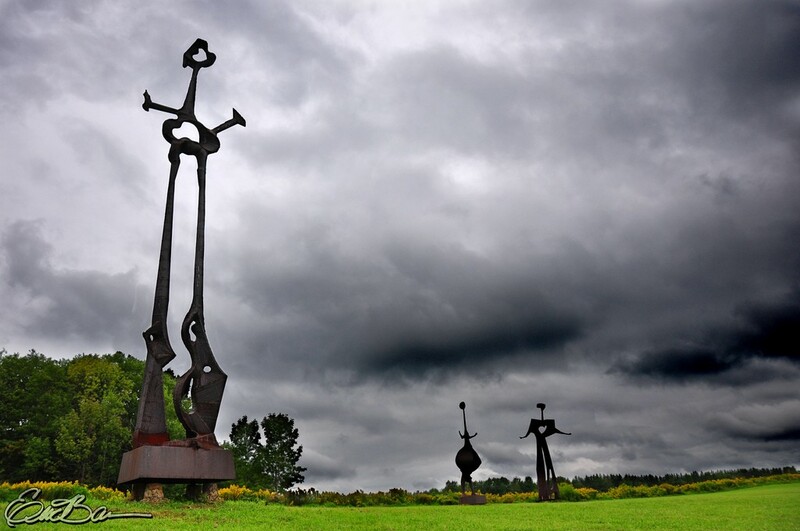 This 400-acre Griffis Sculpture Park houses more than 250 sculptures. 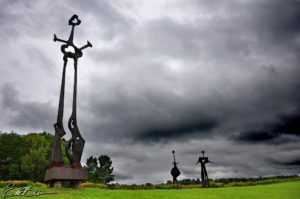 Whether you’re looking for something to climb, sketch or Instagram, Griffis Sculpture Park probably has a charming or thought-provoking piece that will be exactly to your liking. Enjoy hiking the trails and admiring the juxtaposition of man-made sculpture with the lush natural surroundings. Pets and children are both welcome, and admission is affordable and on the honor system. Enjoy a hike and find your own favorite hidden gem of sculpture along your walk. With so many to choose from, no doubt there will be one that speaks directly to you. A fabulous trip to Buffalo must include a stay at a memorable and luxurious hotel. The Giacomo fits the bill, as it has a little of everything going for it. •	Location? Check – it’s so close to Niagara Falls that several of the rooms feature breathtaking views of Buffalo’s top natural wonder. •	An upscale sense of style? Check – the hotel’s suites are gorgeously swoon-worthy (guests looking for the royal treatment should book the Majestic Suite!). •	Relaxed, glamorous gathering places? Check – the Giacomo Lounge offers a wide variety of wines and cocktails to suit any taste and an elegant setting in which to enjoy them Guests can take their libations to the upstairs lounge to enjoy a view of the falls while sipping their beverage of choice. Bibliophiles, rejoice! At Old Editions, one of the largest retail booksellers around, you can spend the entire day getting lost in their 35,000+ square feet of books, art, and collectibles. The store includes an impressive collection of first editions, signed books and more (be aware – a chaperone is required to peruse the rarest of these literary marvels). You’re almost certain to find something special while you’re browsing, and for inveterate book lovers, your only issue will be whether you buy too many books to fit in your luggage for your return trip. West Side Bazaar isn’t just one hidden gem; it’s an entire retail area filled with them. The bazaar serves as a gathering place for food and retail vendors, a haven for foodies and an incubator for up-and-coming businesses. While bazaar businesses may change on occasion (several of the food vendors have successfully left the pavilion to launch their own restaurants), many in-the-know customers can’t get enough of the worldwide range of flavors on display at the bazaar. Fan favorites include injera from Abyssinia Ethiopian Cuisine and samosas from M Asian Halal (just make sure to grab a mango lassi to counter the flavorful spices). Gourmet Lao Foods was previously housed in West Side Bazaar and is one of the incubator’s success stories. Now in a location on Grant Street near the university, the restaurant offers a full and diverse menu and still offers the sesame cookies that have a cult following among local foodies. Here’s the thing about hidden gems. With the internet and social media, it’s pretty likely many fantastic spots in and around Buffalo won’t be hidden for long. Go enjoy them, and all Buffalo has to offer, as soon as you can.